All of the items I used I got at Hobby Lobby for 50% off!! 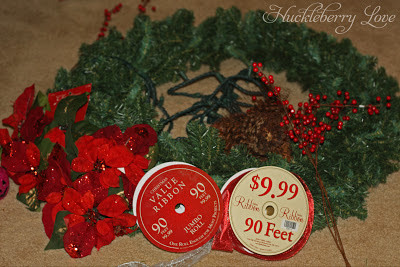 The wreath was $20, the ribbon was $10, the poinsetta sprigs were $8, the holly was $2, and the the pine cones were $1 . I happened to have the strand of lights, but this time of year, you can find them at pretty much any store for under $10. My total cost was $41, a savings of over $100!! The first thing I did was weave the strand of lights into the wreath. 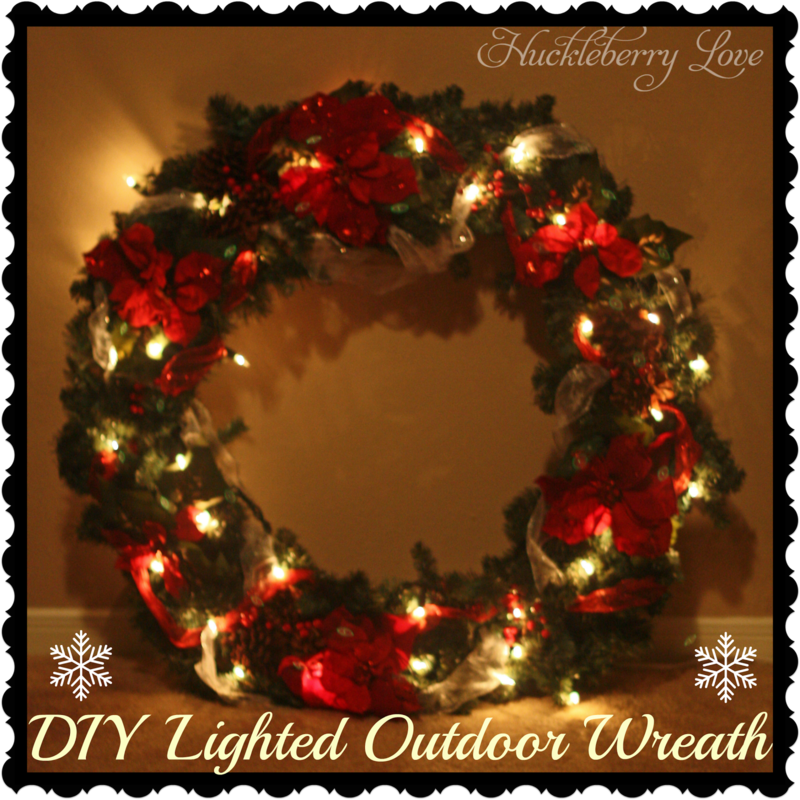 Make sure to weave it around the wire form of the wreath and then use the branches to cover up the strand. Make sure to plug in the lights after you do this to make sure your lights are spaced evenly before you add any of your decorations. Next I attached the poinsetta sprigs. To attach them I just used the wreath branches and twisted them around the poinsetta petals. I didn't want to use glue, because I didn't know how it would hold up to the weather. This is what happens when you leave your crafting stuff out with a little one around...lol. I added the ribbon next. I wove it into the wreath the same way that I wove the strand of lights into it. I crisscrossed the two different colours of ribbon alternating over and under the poinsetta sprigs, to achieve better coverage. Next I twisted in the holly berry sprigs. Make sure that you use wire sprigs instead of plastic ones so that you can twist them into the wreath easily. And, last but not least, I added the pine cones. Instead of glue, I used string to tie them onto the wreath. When you tie them on, make sure you tie the string around the wire form of the wreath and not just the branches so that it holds tightly. 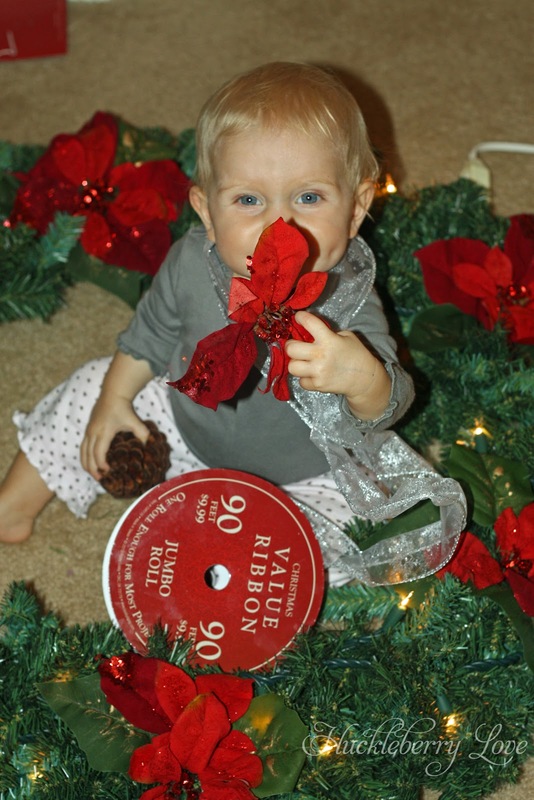 The great part about this wreath is that you can be really creative with it. You can add basically any appliques you want, which gives you a ton of freedom. I am really happy with how it turned out. I think it is really pretty and best of all, inexpensive. 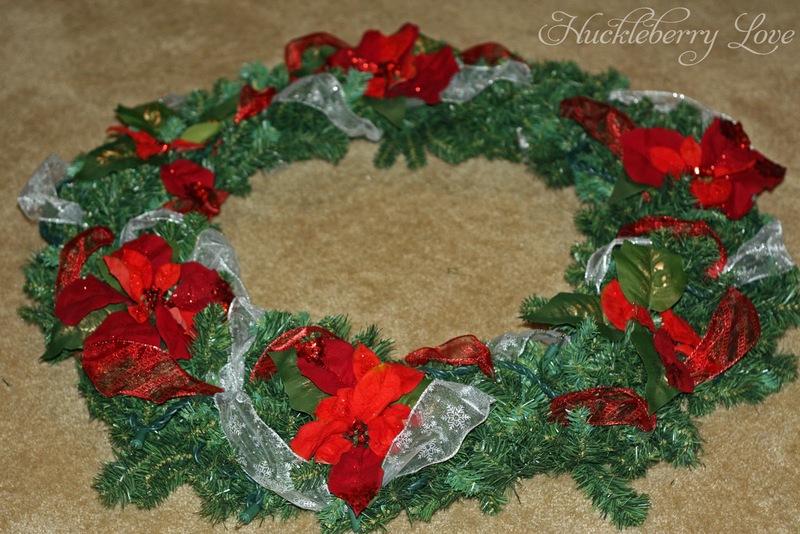 Have you ever made a Christmas wreath? 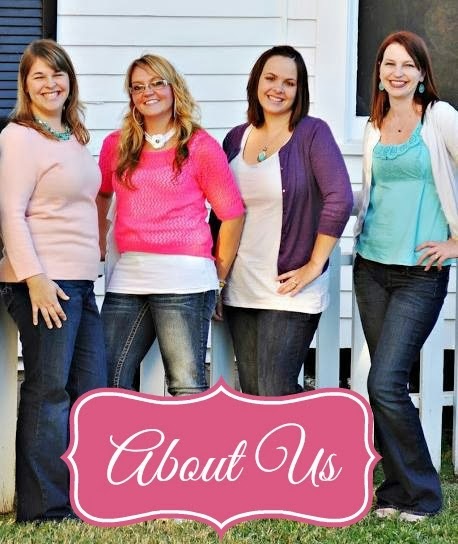 What appliques did you use?